When shopping for a diamond for an engagement ring, a lot of people stress over the color. We're here to clear it up (pun not intended). Many people assume that a colorless diamond will appear more brilliant, but color really has nothing to do with brilliance (that's cut all the way). But it is still an important factor because it contributes to the overall appearance of the diamond. This doesn't mean you need to put your money towards a high color grade (again, put it towards cut). In fact, this is an area you can save a considerable amount of money. The casual admirer will not be able to make the distinction between color grades. In this guide, we'll talk about what to consider when it comes to color and how to pick the most ideal color for the best value. We'll be using real examples from James Allen diamonds, one of our favorite online diamond jewelers. 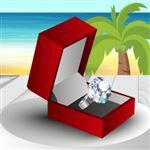 Best Diamond Color: The naked eye can't tell between "colorless" D-F diamonds and the slight yellow tint of grades G-J. Setting and style matter, too. Colorless diamonds need a white gold or platinum band to enhance their icy appeal, while yellow gold complements to G-J grade ones. Keep reading to learn the smart rules to shop by. The color of a diamond refers to a tint found in colorless diamonds (not talking about naturally yellow, pink, blue, etc. fancy-colored diamonds). True colorless diamonds are extremely rare in nature and most will have a yellow tint. D-F (Colorless): D's (the highest grade) are absolutely colorless and extremely rare. E and F are considered colorless (and also super rare) because only an expert gemologist can detect tiny, tiny traces of color. There is no visible difference between these diamonds. G-J (Near Colorless): A slight undertone of yellow can be detected by an expert gemologist. Even though GIA groups this as "near colorless," we're reluctant to include J in this group, as color becomes more noticeable at this grade. For this color grouping, check out our guides for G,H, I and J.
K-M (Faint): A yellow color is more noticeable at this point (i.e., it can be seen without comparing it to a higher color grade diamond). Usually, online retailers don't sell diamonds for engagement rings less than a K. Personally, we think K Diamonds look great on yellow gold rings. N-R (Very Light): Very noticeable yellow tint and looks like a poor quality diamond even to an untrained eye. Before going to a local jeweler, consider reputable online retailers like Blue Nile and James Allen. These stores offer high-quality images and videos of their gems so shoppers know what they're getting. GIA determines color by placing the loose diamond upside down and comparing it against a set of master-stones. The diamonds are flipped upside down because color is more obviously seen this way. It's actually very hard to tell color differences when viewing the diamonds face-up. For example, do you see how from the side view, the yellow tint in this diamond is more obvious than when looking at it face-up? Don't worry, though, because when mounted on a ring, people will only be looking at it face-up. This example was taken from a diamond graded with the color H. Just looking at this diamond alone probably means nothing to you. So now, let's take a look at how all the colors compare side-by-side face-up. The diamonds here represent the color range from D to K. At what point do you start to see a very noticeable yellow tint? The diamonds in the top row are D-F, or colorless, diamonds. You shouldn't see any yellow in the interior. Any yellowness you see around the edges is due to purely external factors like lighting or reflections off the photographer. The second row are G-I, or near colorless diamonds. This is the range we recommend for the best value for your money. If you cover up the top row with your hands, you'd probably think these diamonds look pretty white too. At the color of I, you can more clearly see a tint of yellow, which is why our recommendation stops here (for white gold/platinum bands - we'll talk about gold bands later). The bottom row are graded J and K. While J is still considered "near colorless" by GIA, we think the yellow may have a pretty good chance of being apparent. In general, we wouldn't recommend diamonds from this range if you want to play it safe. 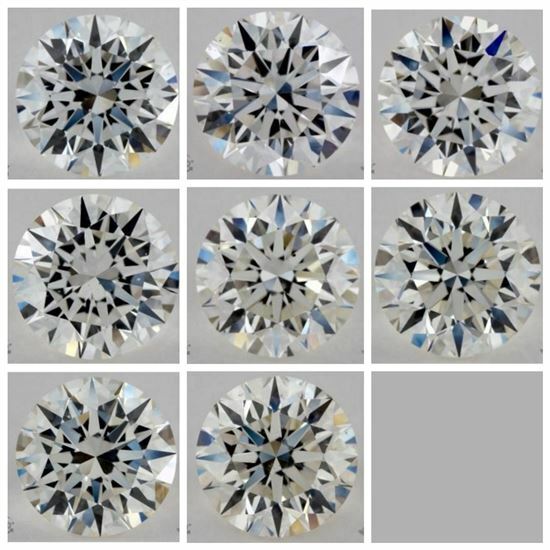 Please note: These diamonds were chosen to illustrate color differences ONLY. We did not carefully choose them to ensure that they are eye-clean or for other factors. When you're looking at diamonds side-by-side like this, it may be easier to pick out which diamond looks more yellow than its neighbor. Plus, these diamonds are magnified. But the truth is that the naked eye cannot see the difference in color so easily. Are Colorless Diamonds Worth the Premium? Colorless diamonds (D, E, F) are priced at a premium because of how rare they are. D diamonds are completely colorless, while F diamonds have tiny trace amounts of color only detectable by a trained gemologist when viewed face-down. But the average eye cannot tell the difference whatsoever. The normal person cannot tell the difference between a colorless diamond and an H diamond. Sometimes, people can't even tell the difference between colorless and J! Especially since diamonds on rings are only admired face-up and reflect light back into the viewer's eyes. So is it worth the extra dough just to have "colorless" on a piece of paper? This is a very personal choice. Some people (especially in the Asian market) are after perfection, and love knowing they have something so rare. Some people also enjoy the very icy-white look of a D-colored diamond. But for the average person, an H diamond will also appear perfectly white. Paying extra for that "colorless" stamp is just paying for something that you can't fully appreciate. It takes at least 3-4 grade differences for color be apparent when the diamonds are compared next to each other. So unless your fiancée is going to be comparing her diamond side-by-side with her best friend's absolutely colorless one, it's a pretty safe bet that she won't know that her diamond is "near colorless." 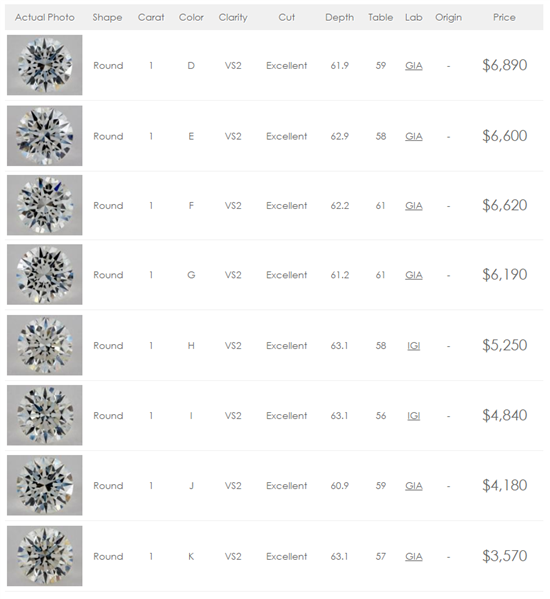 Now that we've established that you will most likely not notice the difference between near-colorless and true-colorless diamonds, let's take a look at how wildly the price can swing based on color alone. 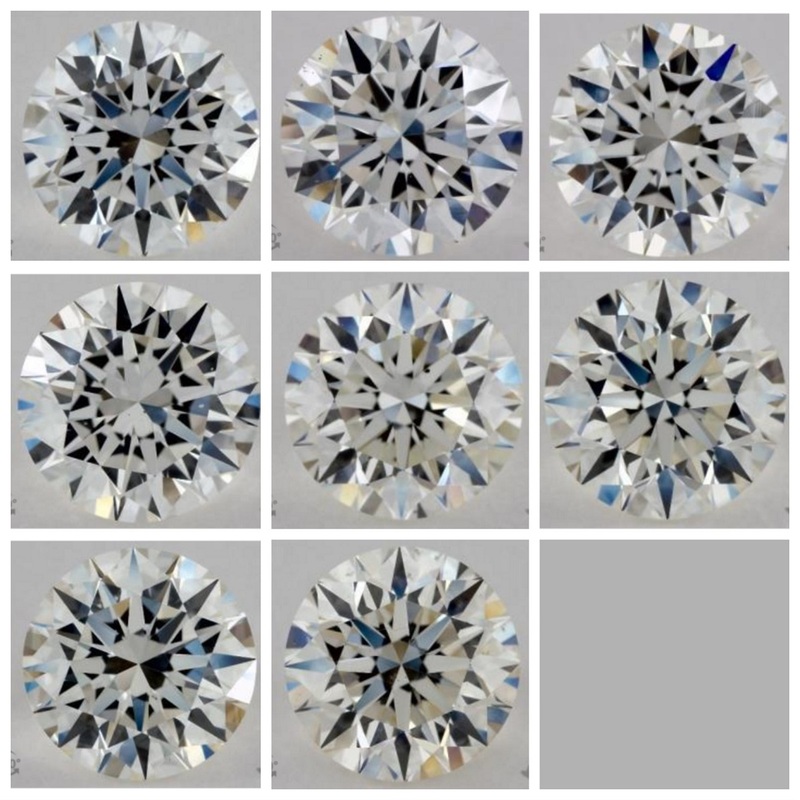 To see examples of various diamond color grades, be sure to visit James Allen's inspiration gallery. We'll be using the same diamonds as above. All these diamonds from James Allen are 1-carat (as the benchmark), clarity of VS2, and an excellent cut. The only difference is the color. To keep it fair, we selected one of the lowest priced diamonds with these characteristics for each. Wow! The price difference is staggering. A true colorless 1-carat diamond goes for almost $7,000, while going down to an H diamond is $5,250. If the difference in color can hardly be detected by the naked eye without a side-by-side comparison, I think it's clear what the better budget-friendly option is. Tip: If you're buying from an online diamond store without photos and feel REALLY unsure, G-H is a safe bet. You'll pay a bit more, but you can be confident that no yellow tinges will be noticed. But this is why we don't recommend making such an important purchase blind. On James Allen, you can search for the diamond that looks perfect to you and spin it around to view it in HD at all angles. We've talked about prices and compared color side-by-side, but really, choosing the right one is so much more complicated than that. The color of the metal you choose for the setting will have a significant impact on how white (or yellow) your diamond appears. You probably already know what color metal your girl prefers - whether it's white gold or platinum, yellow gold, or rose gold - and this is most likely non-negotiable. So now, you just need to select a diamond color grade that works best with the metal. Take a look at these two rings. Without us telling you what diamond was used, which looks better to you? Would you be surprised if now we reveal that both diamonds have a color grade of J (the very bottom of the near colorless range)? As you can see, the one set in yellow gold complements the band very well, while the one set in platinum looks noticeably yellower in comparison. The one in yellow gold even looks way whiter! If you know you want a yellow gold or rose gold band, you can afford to go down in color even more, to a J or K (some people even do M), and it will look completely fine. Whether you're okay with J for white gold or platinum bands depends on you. Both diamonds have a color grade of F (the bottom of the colorless range). But the one set in yellow gold has more of a yellow tint. A diamond will naturally pick up the color of its surroundings (in this case, the band). So if you're setting it in a yellow gold band, even the most colorless, iciest of diamonds will take on a warmer, yellow tint. In this case, it's a waste shelling out dough for a colorless diamond. Put that money towards a better cut instead. Tip: If you're not sure how the color of your diamond will look against the band color, you can view different scenarios on James Allen. For example, for the above setting, you can play with different metals and diamond characteristics and view an HD 360-degree video for each. The setting makes the biggest impact on how color is perceived. If you still want to go for a D-F (colorless) diamond, you'd want a platinum or white gold setting. This would be wasted on a yellow band, because the diamond will pick up the color. For white gold or platinum settings, we don't recommend going below I. If you already know you want a yellow or , a diamond with faint yellow color could look gorgeous in these cases. You can relax a bit with the color requirements and safely go down to a K.
As always, cut is the most important, as this is what makes the diamond shine. So never skimp on it! A well-cut diamond lower in color grade will appear more brilliant than a poorly cut, colorless diamond. The shape of the diamond plays a large role. Well-cut round diamonds are fiery and brilliant, and do an excellent job of masking tinges of color. On the other hand, fancy-cut diamonds with pointed tips (like marquise and pear) can trap color at the points. If you're after one of these cuts, it's best to go up a color grade (to H at the lowest). Step cuts (like emerald and asscher) are known for their depths and luster, rather than their brilliance, so color is more easily revealed. For these cuts, you may want to go up one more grade. We recommend a color of at least G for the best looking stone. Tip: Recommended colors are for white gold or platinum bands. Remember, you can afford to go down in color a couple of grades for yellow gold, so adjust accordingly. Size matters too. If you're purchasing a bigger rock (2 carats or over), you'd want to go slightly up in color as well, since color in bigger diamonds will be more visibly noticed. For more information on the stone's size, check out our guides for 1 carat, 2 carat and 3 carat diamond engagement rings. Hopefully, you now see why there's no need to go out and purchase the highest color grade you can afford. Near-colorless diamonds in the G-I range will offer the bang for your buck, as the casual observer will not be able to tell the difference. Take the setting into consideration too, as it'll have the largest impact on how color is perceived. In our opinion, the most important thing is that you choose a color that matches the setting. Share on Facebook "Best Diamond Color: Why G, H, and I are Good Value"